Burberry has a number of fashion lines, and their Brit line, is the British brand's youngest line, with Select model Alex Dunstan once again fronting the campaign for their 2013 Spring and Summer menswear collection. The 2013 spring/summer Brit men’s line maintains all the traditional elegance, however features a casual and sporty design. Christopher Bailey, Burberry Chief Creative Officer, has reworked the icon mid length trench coat offering an array of neutral colors to military green and a range of browns, from the lightest sandy tones to the darker browns, including the classical black and blue, but has also added a super bright red and a stunning electric blue. The coat’s styles range: from parkas, duffels, field jackets to the classic pea coat and fur trimmed blousons are for the most part sober, however still trendy – with just a bright color or so in two of their models - but have none of the eye watering, bright and shimmering metallic hues seen in Burberry’s 2013 Prorsum spring and summer collection. Burberry’s biker jacket collection features the softest leathers, from suede to goat skin to sherling. The style choice for their puffers and quilted jackets for those colder or rainy spring days is enormous, from cabans, bombers, Harrington styles, to down filled jackets and gilets. The knitwear is in either wool that can be found in crew, Henley or classical styles or in the much more prestigious merino wool or chashmere, that can also found in of their hoodie lines. The plaket polo shirts come every basic color of the rainbow and also in some important and bold stripes, while the t-shirts also come in contrast or irregular stripes. 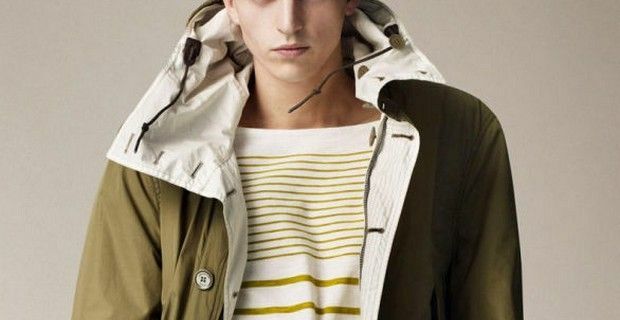 Burberry also offer all types of jeans including colored, both in skinny fit and slim fit models, and modern skinny fit cotton chinos or stretch fit pants, that can be either dressed up or down depending on the mood.